Late last year, the Government of Saskatchewan conducted a secretive library review. They held a series of meetings with employer groups, but library workers and the public were not included in the process. The Government of Saskatchewan has finally decided to let the public have a say. They are accepting public comments on the future of our provincial libraries until January 24. The survey covers eight themes, as identified by the review panel: Funding Structure and Predictability, Provincial Public Library Strategic Plan, One Card, One Province, Communication with Provincial Library, Governance Training, Indigenization, Value of Public Libraries and Legislation. While the report outlines several important areas, there are important issues that the government did not include in its report. It is important that we raise our voice now to ensure that the government’s library review reflects the issues facing front line workers. Let the government know how important stable, long term provincial funding is for libraries. 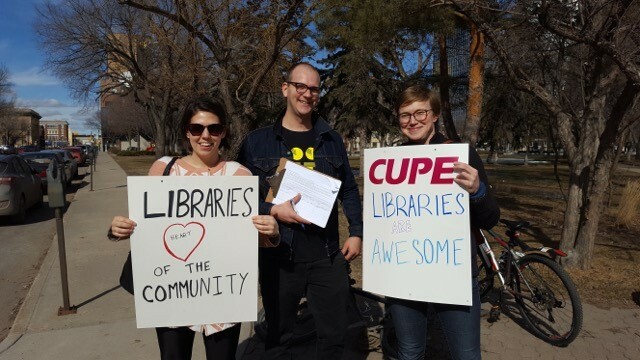 CUPE represents 578 library workers in eight libraries across Saskatchewan: Regina, Saskatoon, Lakeland (North Battleford area), Palliser (Moose Jaw area), Parkland (Yorkton area), Southeast (Weyburn area), Wapiti (Central Saskatchewan) and John M. Cuelenaere (Prince Albert).